Yes, another Christmas card! I am loving all the new Christmas images form WOJ and should hopefully have enough Christmas cards done and ready to send in time this year! 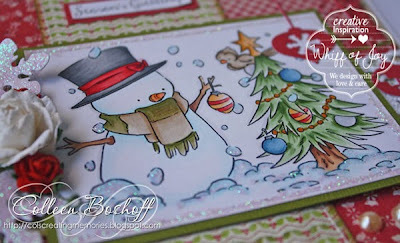 This cutie is 'Deck the Halls - Cute Snowman' and I love the details in this image, so sweet. The papers are Authentique 'Joyous', the baubles are WOJ's 'Christmas Baubles' Die-Lights, snowflakes are WOJ's 'Snowflakes Trio' Die-light and I added Distress stickles to them, flowers are Wild Orchid and finished my card off with some lace and pearls. This was my card for WOJ's #167 Challenge, you can still join in if you quick, there is a few hours left! 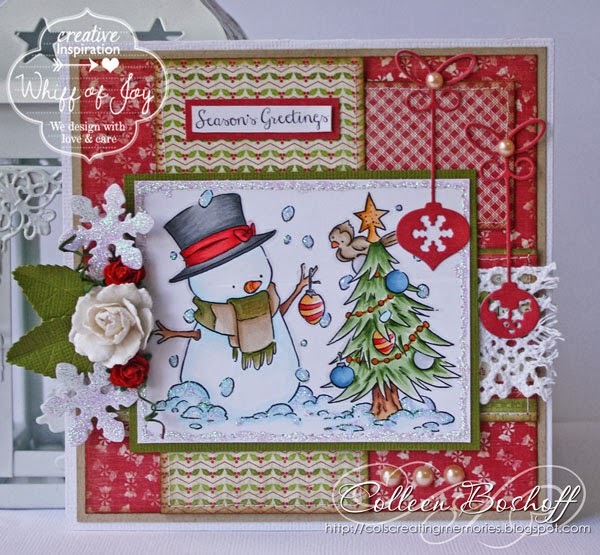 Very wonderfull card creation in the typical christmas colours, looks great!